This species is not strictly a tropical fish despite usually being sold as such. 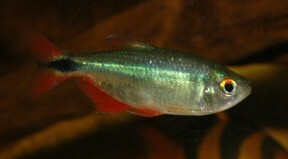 Specimen from the Singapore aquarium trade with slight damage to lower caudal-fin lobe. 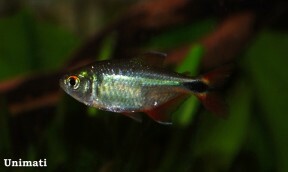 Specimen from the Irish aquarium trade. This species is hardy and suitable for inexperienced fishkeepers. anisitsi: named for Professor J. D. Anisits of Asunción, Paraguay, who collected the type series. Widely-distributed throughout much of the Paraná river system in Brazil, Paraguay, and Argentina, plus the Uruguay watershed in Uruguay and Brazil. Type locality is given simply as ‘Villa Rica, Paraguay’, this referring to the city of Villarrica in Guairá Department, central Paraguay, with some of the type series also deriving from Estancia la Armonia in President Hayes Department. Some records from Buenos Aires province, Argentina are now considered to refer to the similar-looking congener H. togoi (Miquelarena and López, 2006) so the common vernacular name ‘Buenos Aires tetra’ may in fact be somewhat misleading. Occurs in smaller streams and tributaries more often than in major river channels and is also common in floodplain lakes, backwaters and oxbows. In the Esteros del Iberá wetland reserve, Argentina, it occurs sympatrically with a number of other genus members including H. auca, H. elachys, H. eques, H. igneus, H. luetkeni, H. meridionalis, H. reticulatus and H. wajat. All its natural waters lie in a subtropical region with abundant rainfall and relatively mild winters. An aquarium with base dimensions of 90 ∗ 30 cm or equivalent should be the smallest considered. Temperature: 16 – 28 °C; it should not be maintained at temperatures towards the upper end of this range for extended periods (see ‘Habitat’). Has a reputation for nipping the fins of tankmates though this behaviour only tends to be pronounced when insufficient numbers are purchased or space is limited. It is a gregarious species forming loose hierarchies, with rival males continually battling with each other for female attention and positioning within the group. A group of at least 8-10 specimens should be considered the minimum requirement since this increases the likelihood that the fish will be distracted by each other rather than their tankmates but will result in a more effective, natural-looking display. Males will also show better colouration in the presence of conspecific rivals. 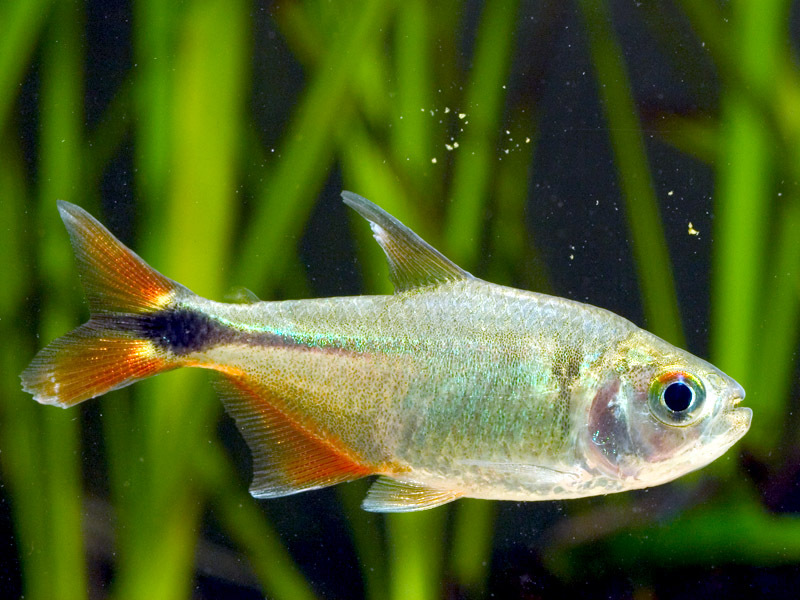 That said it is relatively boisterous and doesn not make an ideal companion for very shy, slow-moving, or long-finned fishes such as many livebearers, cichlids, and anabantoids. Robust fishes inhabiting similar biotopes in nature, especially comparably-sized, open water-dwelling characids perhaps constitute the best choices but other potential options include callichthyid, loricariid and doradid catfishes or benthic anostomids and curimatids from genera such as Schizothorax and Characidium. 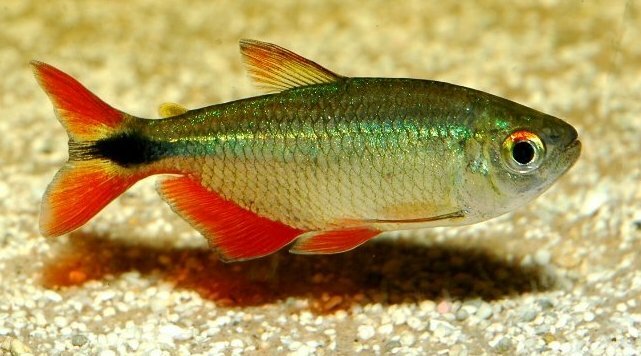 If geography is not an issue many rainbowfishes and cyprinids are also suitable, but be sure to research your choices thoroughly before purchase. Sexually mature males are noticeably more intensely-coloured, slimmer-bodied and remain a little smaller than females. When in good condition adults will spawn often and in a mature aquarium it’s possible that small numbers of fry may start to appear without intervention, but if you want to maximise yield a more controlled approach is required. The adult group can still be conditioned together but a smaller aquarium should also be set up and filled with mature water. This should be very dimly lit and the base covered with some kind of mesh of a large enough grade so that the eggs can fall through but small enough so that the adults cannot reach them. The widely available plastic ‘grass’-type matting can also be used and works well, as does a layer of glass marbles. Alternatively filling much of the tank with a fine-leaved plant such as Taxiphyllum spp. or spawning mops can also return decent results. The water itself should be of slightly acidic to neutral pH with a temperature within the range suggested above. An air-powered sponge filter or air stone(s) should also be included to provide oxygenation and water movement. 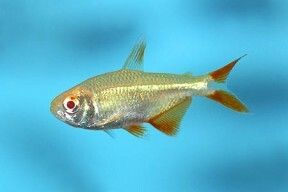 This species is a popular and hardy aquarium subject and an albino (sometimes traded as ‘golden’) strain has been selectively line-bred for the hobby. H. anisitsi looks very similar to the congener H. auca but can be told apart by possessing a single maxillary tooth with 3-5 cusps (vs. always 5 cusps in H. auca), dentary depth 50.0-53.3% of dentary length (vs. 40.7-47.6 %), and lacking small hooks on the dorsal, caudal and pectoral fins in males (vs. possessing small hooks on these fins in males). An annotated list of characin fishes in the United States National Museum and the Museum of Indiana University, with descriptions of new species. A new species of Hyphessobrycon (Characiformes, Characidae) from the río Uruguay basin, Argentina. 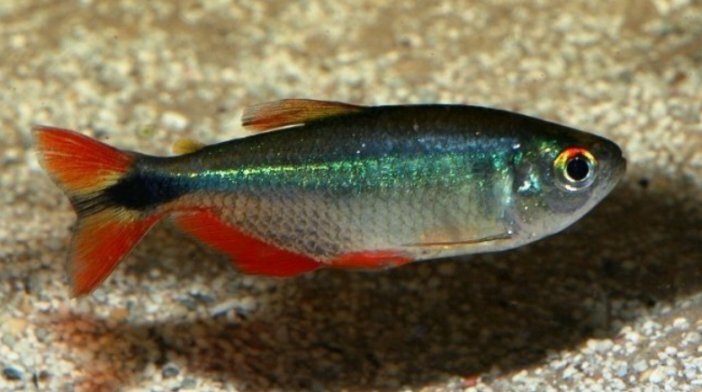 A new species of Hyphessobrycon (Characiformes, Characidae) from the Esteros del Iberá wetlands, Argentina. Hyphessobrycon togoi, a new species from the La Plata basin (Teleostei: Characidae) and comments about the distribution of the genus in Argentina.